Confederacy, 1862, 5¢ blue, Stone 2, large even margins, cancelled by dark red Crawfordville Ms. cds, small thin specks, Very Fine appearance. 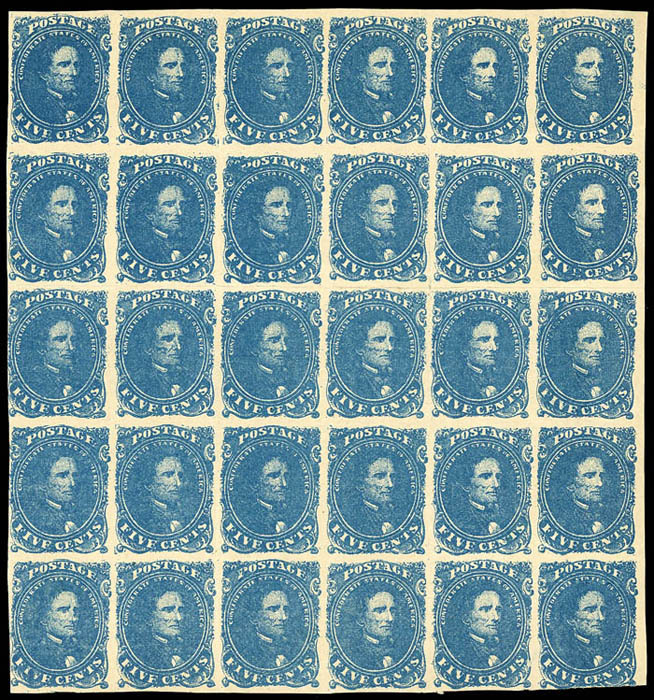 Confederacy, 1862, 5¢ blue, Stone 2, block of 30, positions 5-10 / 15-20 / 25-30 / 35-40 / 45-50, large margins to just touching at bottom right and left center, very fresh with rich color, light creases mostly in margins between stamps and thins in top and bottom corner stamps at right, o.g., some never hinged, otherwise Very Fine. 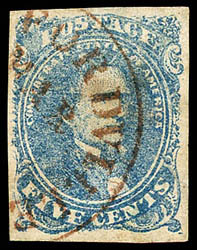 A REMARKABLE LARGE MULTIPLE OF THE 5¢ BLUE LITHOGRAPH ISSUE. 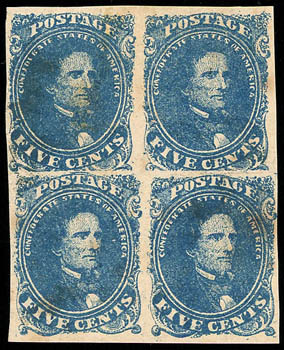 Confederacy, 1862, 5¢ blue, Stone 2, gutter block of four showing unusual spacing and narrow gutter between horizontal pairs, pos. 43-44 (upper pane) and pos. 3-4 (lower pane), top stamps with "clipped" short transfer varieties, o.g., never hinged, some gum toning, Very Fine, a wonderful position block; with 2014 C.S.A. certificate. Scott No. 4 $1,300 as normal o.g. block. Position 43R is the minor clip variety (4-2-v5) and 44R is the major clip variety (4-2-v4). The horizontal alignment also shows skewed placement. 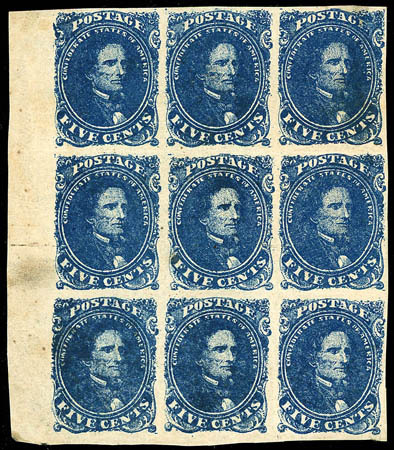 Confederacy, 1862, 5¢ blue, Stone 2, left margin block of 9 (positions 21-23/31-33/41-43), full o.g., position 21 showing the spur in upper left scroll variety, rich color, flaws including small thin spots and some light creasing, Very Fine appearance. Confederacy, 1862, 5¢ blue, Stone 2, Position 36, large margins, intense color and impression, cancelled by green Castroville Texas town cds, Extremely Fine and rare green Texas town cancel; with 1989 P.F. certificate. 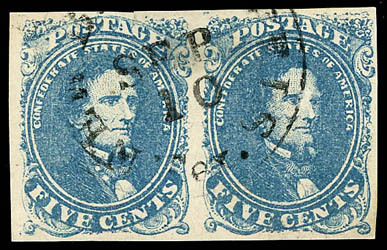 Confederacy, 1862, 5¢ blue, Stone 2, horizontal pair, full to large margins, cancelled by "New Braunfels, Tex., Sep 10" cds, thin spots, left tiny tear, Very Fine appearance. 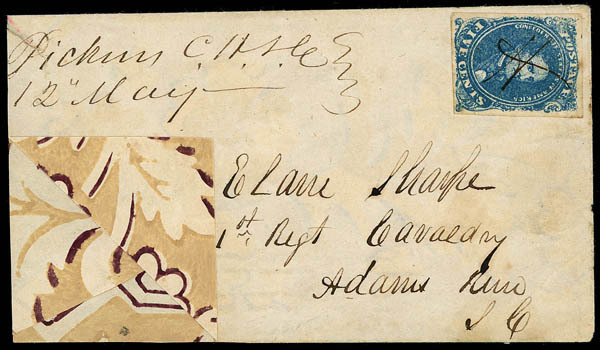 Confederacy, 1862, 5¢ blue, Stone 2, position 38, large margins, manuscript cancelled, matching "Pickens C.H., S.C., 12 May" postmark on lovely wallpaper cover with magenta, tan and white floral design addressed to "Capt. Elam Sharpe, 1st Regt. Cavalry at Adams Run, S.C."; small tear affecting postmark, Very Fine and attractive. 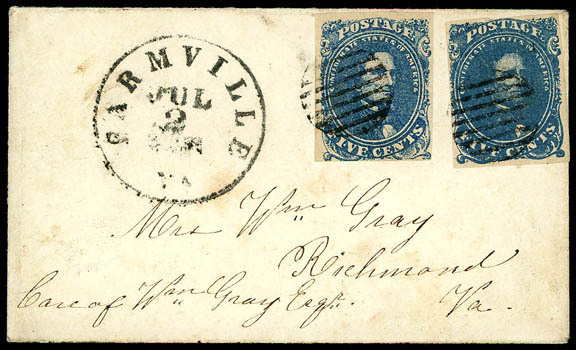 Confederacy, 1862, 5¢ blue, Stones 2 & 3, two singles, left stamp being Stone 3 and right Stone 2, margins to barely touched, strong colors, tied by grid cancels, matching "Farmville Va., Jul 2, 1862" cds on small cover to Richmond Va., Very Fine and rare combination franking of two different stones. Scott No. 4 Estimate $400 - 600. 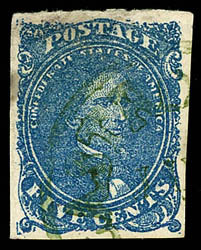 Confederacy, 1862, 5¢ blue, Stone 2, Position 25, large margins, strong impression, tied by neat "Georgetown, S.C., Mar. 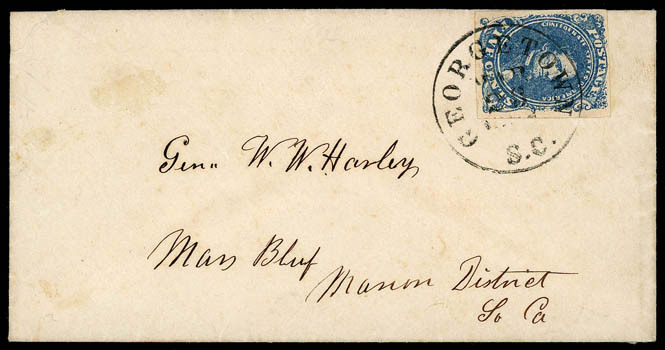 23, 1862" cds on fresh cover addressed to "Gen. W. W. Harley, Mars Bluff, S.C."; cover refolded at top, small corner tear top left, Very Fine and choice use, ex-Caspary, Myerson. Harlee was the president of the Wilmington and Manchester Railroad. Confederacy, 1862, 5¢ blue, Stone 2, Position 44, margins to touched at right, tied by "Randolph Macon College, Ca. Apr 14" cds on homemade cover to L.W. 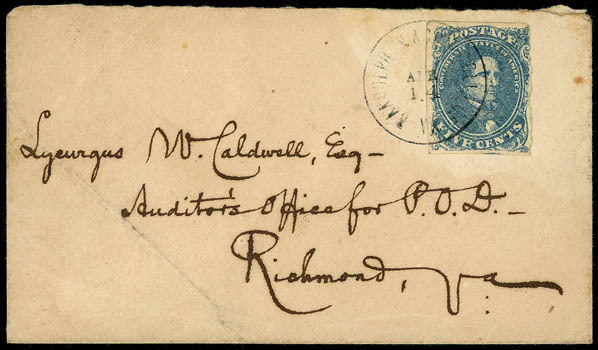 Caldwell at the Auditor's Office for the P.O.D., Richmond Va.; cover crease, F.-V.F., a scarce college town cds.